Next in the series is my conversation with entrepreneur, adventurer and environmentalist Sir Richard Branson. Mark Tercek: Why did you become so involved in environmental issues? Sir Richard Branson: Business as usual is wrecking our planet. Resources are being used up. Air, sea and land are heavily polluted. The poor are getting poorer. The short-term focus on proﬁt has driven most businesses to forget about their important long-term role in taking care of people and the planet. All over the world people are demanding that business as usual changes -- as we've seen in the Occupy movement. One of the great benefits of information technology is that people are now directly connected to those suffering as a result of economic unfairness and are no longer prepared to accept it. We must work hard to change all this. I have always looked on my businesses not just as money-making machines, but as adventures that can, I hope, make people better off. I am passionate about many things but conserving our planet and its species is a high priority of mine. We need to learn and always remember that our actions today will dictate the type of world our children and grandchildren grow old in. It is our greatest responsibility. We all have a part to play and I believe we all have to embrace the challenge to change. Of course an individual can make a huge difference but it is when those individuals come together with like-minded souls that they can change the world for ever and importantly for the better. Mark Tercek: You just co-hosted the Caribbean Summit of Political and Business Leaders. Tell us about your role in the Summit. Are you satisfied with the outcomes? Sir Richard Branson: Business can and needs to play a major role in making effective marine conservation in the Caribbean region a reality. One thing we agreed at the Summit is that government and business must come together on the interlinked issues of conservation, economic development and renewable energy. There are literally thousands of businesses, many in the tourism industry, that depend on an intact marine environment for their long-term survival. It's clear that it is in the best interest of business to be part of the conservation, along with governments and civil society. It therefore seemed quite logical for us to offer Necker Island as a place to come together and discuss ways in which governments, companies and others can help protect the region's marine and coastal environment. The outcome really exceeded our expectations. The Summit participants pledged roughly $64 million to support marine and coastal conservation, on top of impressive government commitments to create more protected areas and business announcements to put in place more sustainable practices. I think we have come much closer to our goal of protecting 20 percent of coastal and marine resources by 2020. During the summit we issued a communique that sets out our priorities of protecting rays and sharks across the Caribbean within two years, dramatically increasing the uptake of alternative energy sources within five years, and to starting work as a region on creating enabling policy frameworks. It's an impressive list of commitments, and we will make sure that everyone follows through on what they promised. Of course, Virgin will do its part. We are already working on a project to move Necker Island entirely to renewable energy, Virgin Unite, our nonprofit foundation, will work with the Carbon War Room to help expand the uptake of renewable energy in the region. We've pledged an investment of $100,000 and will start with a feasibility study in Haiti. Mark Tercek: You are also a champion for bold action on climate change, though you have admitted that you were once a skeptic. What shifted your perspective? Sir Richard Branson: It started with a phone call from Al Gore while I was in the bath. He wanted to show me An Inconvenient Truth, and his poignant and elegant reduction of these issues really struck a chord with myself as an interested non-expert. Tim Flannery's book, The Weather Makers, also had a pronounced effect on me. As a big buyer of fuel for our transport businesses, I am very aware of the damage that oil and its greenhouse gas emissions is doing to the environment and the climate system in particular. At Virgin we have been investing the profits from our transport businesses into the research and development of sustainable fuels and other sources of renewable energy. Mark Tercek: How can we inspire a similar societal shift and move from discussion towards real and significant action? Sir Richard Branson: I believe that today's businesses -- regardless of their size -- must be prepared to do good in societies around the globe. I am cautiously optimistic that we can make the world a far better, safer and more equitable place -- but business and enterprise must sit at the heart of this process. We need government and business to work together for the benefit of everyone. It should no longer be just about typical "corporate social responsibility" where the "responsibility" bit is usually the realm of a small team buried in a basement office -- now it should be about every single person in a business taking responsibility to make a difference in everything they do, at work and in their personal lives. We at Virgin Unite, the nonprofit arm of the Virgin Group, call this approach Capitalism 24902 because it's focused on getting business leaders all over the world -- all 24,902 miles of it -- to look at how we can do what is right for people and the planet. Mark Tercek: From your perspective, how do you think the environmental movement is doing? What are we doing well, and how can we improve? Sir Richard Branson: Our efforts to fight global warming are very much still a work in progress. I have been very pleased by the early energy of the Carbon War Room and its ability to bring together disparate interest groups and to engage with both business and government. The Green Fund has made a range of investments across solar, water and energy efficiency and is constantly on the look out for new opportunities -- I am happy with its progress. And the Earth Challenge has generated more than 2,000 entries and an interesting short list of proposals. At the same time we have been working with our companies to change the way they are carrying out their businesses. We have started to make some progress on waste, procurement and fuels. Extending these efforts and ensuring that all business is following this blueprint will be key to the fight against climate change. Beyond that, I think that authorities and scientists should be taking the idea of removing greenhouse gases from the air, aka "negative emissions" more seriously. These are not to be considered an excuse for "business as usual" or a "plan b", but they could be additional tools in the carbon-climate toolbox, and research funding into them, into assessing them and into their governance is very lacking compared to other clean tech areas. Mark Tercek: I argue in Nature's Fortune that business can be a constructive ally to the environment. What role do you see for the private sector in addressing environmental challenges? Sir Richard Branson: There are business opportunities companies can profit from that can help tackle climate change whether or not they are worried about people and the planet. If a business can make affordable solar panels that can give people access to clean energy in areas where there is no electricity network, or fuel is scarce or expensive, then those solar panels are valuable and a business is likely to profit from selling them. Mark Tercek: You are known for thinking big and taking risks, both in business and in your personal adventures. You've crossed the Atlantic and the Pacific in a hot air balloon, achieved the fastest time crossing the English Channel in an amphibious vehicle and are very close to launching the world's first commercial space flight. What's the secret to your drive? What's next? Sir Richard Branson: I've never really seen myself as a highly "driven" person -- that seems like such a negative phrase these days. Lots of things motivate me though. The excitement of setting up new businesses -- by doing that, both I and my team at Virgin, many of who have been with the company for decades, get to learn about new technologies and new territories. At Virgin we enjoy shaking up market sectors which, until Virgin comes along, are generally controlled by a few major corporations and it is always the consumer who loses out; we like to get in there and change that. Our next great challenge, a challenge for us all, is ensuring that we leave our planet in the best possible shape not just for our children but also our children's children. I am also very interested in exploring the oceans. Virgin Oceanic is a submarine that we are developing capable of withstanding incredible pressures, in which to explore parts of the sea that no one has ever been to. 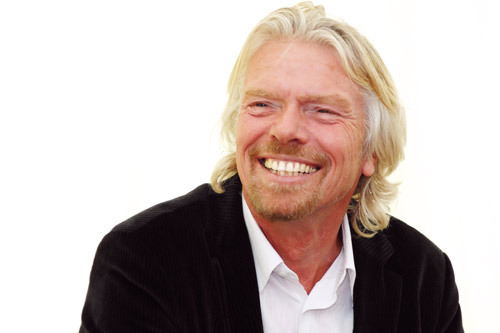 Sir Richard Branson is Founder of the Virgin Group. Virgin is one of the world's most irresistible brands and has expanded into many diverse sectors from travel to telecommunications, health to banking and music to leisure. Through more than 100 companies worldwide, Virgin employs approximately 60,000 people in over 30 countries. Branson has challenged himself with many record breaking adventures, including the fastest ever Atlantic Ocean crossing, a series of hot air balloon journeys and becoming the oldest person to kite-surf across the Channel. He has described Virgin Galactic, the world's first commercial space line, as being "the greatest adventure of all." Since starting youth culture magazine Student aged 16, Branson has found entrepreneurial ways to provoke positive change in the world. In 2004 he established Virgin Unite, the non-profit foundation of the Virgin Group, which tackles tough social and environmental problems and strives to make business a force for good.